An axis shift would cause global catastrophes and extinction events. The Mayan Calendar is far too precise for the Mayans alone to have developed. Their Calendar ends on 21 December 2012 which is the precise alignment at dawn in the east on the Solstice when the sun rises exactly within the Galactic Center Dark Rift in Sagittarius. This event has nothing to do with “gravity” alignments, since a similar alignment occurs every year, but not at dawn on the Solstice. The Astronomy behind Precession of the Equinox yields a repeating time clock of ~25,632 years. Earth Expansion theory refutes Plate Tectonics (PT) theory in PT’s assumption that the earth is of constant size, constant dimension, and axially stable. This “new mass” would destabilize to the Earth’s axis over years of accumulation. The Earth’s equatorial bulge is believed to be the ultimate stabilizer for the axis. No theory has been presented to minimize or overcome this bulge effect. Until now. Nothing will occur on that specific day. If it comes, it will come when unexpected; “. . . as a thief in the night”. Consider this a “Black Swan” possibility. Stop. Open your mind and really listen for a little bit. Most people won’t. Most people can’t. Going against any one deeply held belief causes people to immediately shut down, perhaps especially so if it goes against widely taught scientific consensus. This article goes against a number of those science areas and so will face the standard derision and ridicule, and be ignored. It will not be completely correct. No new idea ever is. It is meant to be short enough that you can endure it with limited cognitive pain. A skeleton of a body of work that can be added to and altered. It can be a longer form if you read the references. Longer still if I ever write the book. Consider this to be what has come to be known as a “Black Swan” possibility. One that is so unlikely to occur, with such a low probability – but with such catastrophic consequences if it does – that it should not be ignored. The flow here is to build a foundation and make it understandable. Read it all, or just the bold or red, skim it, or look at the pictures alone. Whatever works for you.. There are any number of pieces of work and fable and literature that show there have been world wide floods around the Earth. (3, 6, 8, 10, 13, 16, 17, 18, 20, 31, 33, 35, 42, 43, 46) It appears nearly every tribe has such a myth or remembrance in their lore. These floods are rapid, like a Tsunami. Oceans leave their basins. These are mountain topping events. They are extinction events. Massive rocks moved elsewhere. Lands rise to become mountains. Lands fall to become seas. Sea basins rise to become new land. At least picture life with electric lines and pipe lines severed and roads gone. Picture farm lands no longer useable or food deliverable. What would you and your family do? There are many well known icons that have lost their teaching significance. Because what they taught seems no longer relevant. Here is a well known picture of Atlas holding up the world. Except, it is not. It is Atlas holding up the sky. The Sky?Why would Atlas be shown holding up the sky? The sky is constant and ever present. The stars and planets always revolve consistently as the Earth turns. Don’t they? Didn’t they? What would happen if Atlas changed position. Fig. 1 Atlas is Holding up The SKY??? Here is another image of how Hindus describe the structure of the world. 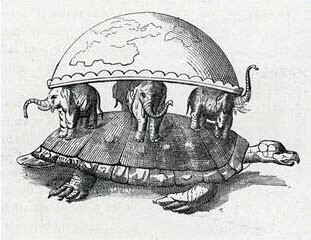 The Earth sits atop the backs of elephants that stand atop a turtle. Could it be that when anyelephant shifts its position there can be regional earth quakes and surface disruptions that can be violent? If so what happens when the turtle moves and all the elephants stumble? Another ridiculous Icon? Perhaps. Can the entire earth topple in such a way? Science says No, emphatically; primarily since the equatorial bulge in the Earth would keep it stable. So we will address the bulge issue as apparently never before. The Earth at the equator has a radius of 13 miles greater than the radius at the poles. That is the extent of the bulge. It is real. The argument for stability is real. The bulge is believed to have been caused by the centrifugal spinning of the earth around its equator. 13 miles seems like a lot of distance when thought of in human terms. But it is only 3/10ths of 1% of the equatorial radius. Certainly it is significant, but perhaps not that significant, nor perhaps constant. There are always more alternative solutions to a problem that we are not made aware of. They should all be analyzed. To possibly account for the above catastrophes’ with a pole shift, the science community allows for only one physical possibility to the Earth’s axis stability – a massive impact from an outside space body. (The science community does agree that Mars had a pole shift and Earth did also, but will accept it only happened hundreds of millions of years ago). However, another alternative to be discussed is in building forces from beneath the earth surface that shift mass and thus would shift the stability of the entire earth body. Evidence indicates there has been no such shift for at least 4 – 5,000 years and so we have become complacent. Two individuals stand out in their studies of recent Pole Shifts, there implications, and the earth surface evidence. Both corresponded and met with Albert Einstein. The complete story of these meetings has not been fully told. (13, 17, 42, 43) The men were Immanuel Velikovsky and Charles Hapgood. 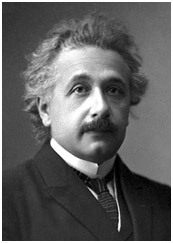 Einstein’s involvement began in 1946 and accelerated in the years and months just prior to his death in 1955. Both authors speculated on the location of the most recent prior north pole; Velikovsky – Baffin Island. Hapgood – Hudson Bay. In general, Einstein was intrigued by the evidence of a shift by both men. 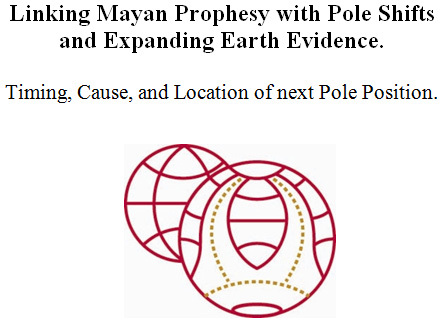 Both authors speculated on a Pole Shift recently, about 12,000 years ago. So even if the timing now appears hoary with age in this internet era, a diligent reader should consider a more complete read. Velikovsky believed the pole shift occurred due to a massive near impact from another solar body. (42) Einstein disagreed strongly with Velikovsky’s physics and cause, but not with the surface evidence. Hapgood took a different tack. He believed that only the surface skin (40 – 100 miles thick) of the earth shifted. He envisioned only the crust displaced over the still solid earth. Like the outer skin of a grapefruit coming loose and shifted over the body. (17) Hapgood knew that mass added to the outside of a spinning top would cause that weight to shift towards the equator. Hapgood believed that the weight effect was caused by an increasing mass of ice forming in Antarctica. His theory called for shifting poles which in order went from 1) near Alaska, to 2) the North Atlantic, to 3) Hudson Bay to 4) the present position over the last 100,000 years. Consider the trauma effects. 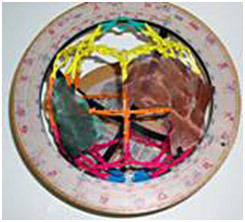 Consider what is known about a spinning gyroscope, like the earth. When the gyro begins to wobble, it slows down. On an Earth gyroscope surface with 70% water, the solid earth would slow faster than the water or the atmosphere. They both would continue to flow to the east, faster than the land. The oceans would leave their basins and the air could become cyclonic in force. Then the water would flow away from the equator towards the poles, as others believed. (20) Likely, back and forth, for a period of time. We’ll return to this incomplete conundrum. This author and article takes a new and different explanation. Here it will be developed that the entire earth (not just the crust) periodically shifts due to a build up of mass below the surface, and that the “bulge” may also become minimized. Briefly, the Mayan Calendar counts out a period of 5,126 years and then repeats itself. (21, 36) It ends at this coming winter Solstice. To understand more fully, one must realize how impossibly accurate this calendar was to be created without using modern instruments. One needs also to understand the Precession of the Equinox’s and how they present an accurate timepiece calendar of about 26,000 years which also repeats itself. Knowing this one can understand that the Mayans were likely accurately retelling a legend from about 10,803 BC when violent Earth movement and climate changes were indicated and left clear evidence in the Greenland and Lake Vostok ice cores. This is a complex subject which we’ll try to make simple. On the dawn of the first day of Spring (March 30) the sun rises due East and there is a significant constellation behind the Sun. This constellation is one of the 12 well known Zodiac Constellations. Fig. 6 shows a Leo alignment. We are currently “in the age of” Pisces (alignment). The other Zodiac constellations will slowly cycle through this position at dawn. The cause of this slow movement is because the Earth wobbles and changes its position slowly. There are 360 degrees in the Zodiac circle. It takes ~72 years of new spring dawns to move the constellation but 1 degree. For reference, the moon takes up ½ of a degree. The span of the Zodiac signs average 30º. It would take ~2,160 years to travel through one Zodiac sign (72 yr x 30º). Over one lifetime this movement would not be noticed. It would take a number of lifetimes to notice this and then have accurate enough records to forecast the future movements. A longer explanation is on my web site at http://eearthk.com/Stars.html. At 72 years per degree, it would take 25,920 years to complete the entire cycle and return. It would appear that the Mayans learned from the Olmecs who seemingly lived in Mesoamerica around 3,000 BC and about which little is known. They did however leave behind sculptures of peoples not expected to be in the Americas, both bearded white people and those with African features. (16) Another mystery. 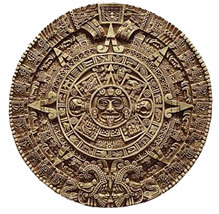 The Mayans Calendar is known as the Long Count Calendar. (21) For our purposes we will focus on the dating and the alignments. The Calendar has a 5,126 year cycle. It started on August 13, 3,114 BC and ends on December 21, 2012 AD. It is believed to be put into use in the 1st century AD. Odd? That means it was put in place after 60% of the time was gone. The following will make it clear that it was the end date they focused on and worked back. They needed the knowledge of precession to do this. A full precession cycle is sometimes called 26,000 years, but one will also see 25,920 (at 1º every 72 years). At 71.5 years per degree one gets 25,740 years. At 71.2º per year one gets 25,632 years. Most accurate science specifies 25,772 years. The Mayans with the Long Count repeated 5 times would indicate 25,630 years. So any suggestions between 25,500 and 26,000 years are acceptable for describing the precession cycle. Several things should be pointed out that are not obvious. A “Gravity” effect alignment is not to be feared as this alignment occurs every year, just not at dawn and not at a solstice. Any “Effect” may well be due to the earth being tipped to its maximum (Solstice) when this occurs. The author does not think this was a prophesy of what will occur on this date. Prophesies lack evidence and are often false. 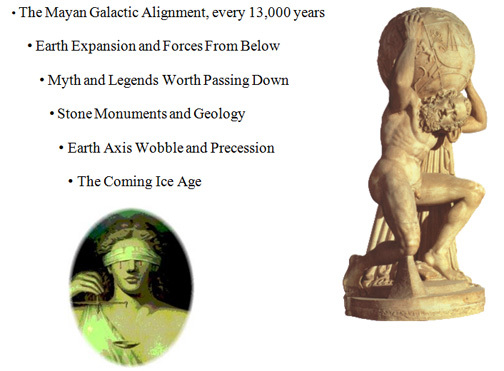 What is believed to be emphasized is what happened the last time this alignment happened. If significant enough, that gets passed down in lore as a potential indicator of what may happen again. When was the last time? A simple way would be to go back 26,000 years. But there is a more recent last time, about 13,000 years ago. 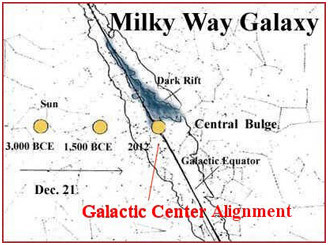 This 2012 alignment is in order: a) Earth, to b) Sun, to c) Galactic Center, while at a Solstice time (full tilt). Reverse the orbit and one gets a) Sun, to b) Earth, to c) Galactic Center at Solstice (not at dawn but at dusk). Taking the full Mayan precession of 25,630 years and the most accurate science at 25,772 years, a half cycle time of 12,815 to 12,886 years ago is developed. Let’s stay with the Mayans timing. From 2012, that would give a past alignment date of 10,803 BC (2012 – 12,815). The best long term climate data is found in the ice cores taken from Antarctica and Greenland. The cores from Lake Vostok in Antarctica go back over 400,000 years and those from Greenland about 100,000 years. The charts give a quick overview and then we’ll get more specific. 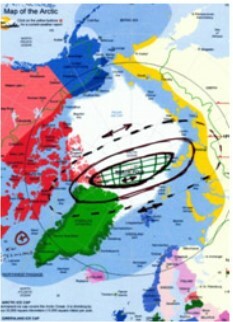 Vostok data is the most well known but Greenland is more relevant. We’ll set the stage first with the Vostok temp record to get grounded. Note there a few and short warm “interglacial” Periods (like now). The rest of the time is mostly long and cold. Fig. 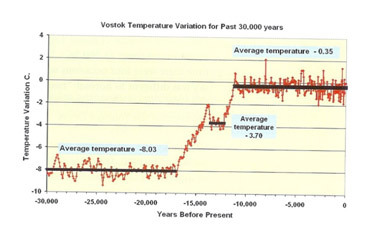 9 shows Vostok data for just the last 30,000 years. Note it was cold below current period and then several jumps when the climate changed. It is difficult to obtain Greenland data and more so to get it overlaid with Vostok’s. Full credit goes to Dr. Lance Endersbee. (12) Several very important issues come out from Fig 10 that are rarely considered. Fig. 9 shows that Antarctica does have significant temperature swings, but it is surrounded by oceans which moderate those swings. Fig. 10 shows that in Greenland – in the northern hemisphere where most people live – there is no huge moderating ocean and the temperature swings are dramatic. A 20 degree Centigrade temperature drop is about a 35 degree Fahrenheit drop. 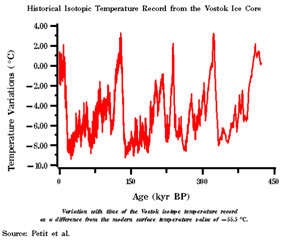 The slight temperature changes in the graph in the modern era shows much smaller swings and yet even those led to the little ice ages. A 35 F. degree drop in average temperature would (and did) lead to extreme climate issues. Now the focus will narrow to the ending of the recent Ice Age events. 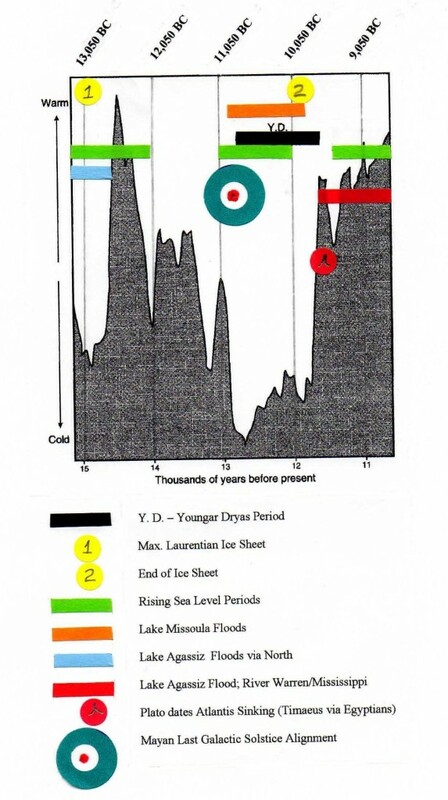 Here some key points are plotted that occurred at the near end of the ice age, from the maximum ice sheet to its final destruction. * The Youngar Dryas cold drop. * When the Lake Missoula floods caused the Washington Scablands. * Later broke through in Minnesota at River Warren. * The blue Bulls eye marks the Mayan alignment date of 10,803 BC. For good measure, * the date Plato (at ~360 BC) indicated for the sinking of Atlantis was marked. Perhaps the last two were just lucky guesses. History shows these were traumatic times with violent surface and climactic changes. Many North American animals went extinct.27 The Galactic Alignment would have been prominent and could well be used by ancient peoples in pass down tales. The theory behind Expanding Earth or Growing Earth (EE or GE) disagrees with Plate Tectonics. Within EE, there are no wandering continents bumping into each other. There is no or very little Subduction of earth surface. If not familiar with EE, the astute reader needs to study at least the Carey book (7). Ugh. Numbers and equations are a turn off to many. We must use a few. For our EE purposes we focus on: 1) the findings that the earth radius is enlarging today at ¾” per year and that it is expanding at an ever increasing rate, and 2) gravity has been increasing (which accounts for the fossil size changes) and this indicates new mass is forming and shifting within the body of the Earth. The Earth has an average density. For simplicity we assume the new mass is forming at this same average density. The numbers get too large to think about and so we converted to Billion Ton Units (short, 2,000 lbs.). Thus, EE Mass Gain 59,156.6 Billion (Short) Tons per year. Hapgood’s theory of added mass of Antarctic Ice was rejected by Einstein as insufficient. It does provide a good starting point as to what would be sufficient? Hapgood estimates the ice volume of Antarctica to be 6,000,000 Mi³ (17, Note 3, p 338) Water has a weight of 62.4 lbs/ft³. So the full weight of Antarctic ice is about 27,555,457 Billion short Tons. With the estimated EE annual mass gain it would take less than500 years of accumulation to equal the entire weight of Antarctic ice. In a half precession cycle of about 13,000 years, the earth mass gain could be about 28 times the entire Antarctic Ice mass. What about the Bulge Effect? In Hapgood’s book (17 Note 6, p. 364) he had the stabilizing effect of the bulge calculated to be: 41,192,000,000,000,000 metric tons. These are 2240 lbs, vs. our 2,000 lb short tons. This converts to 4,696,040 Bil short Ton Units which would be but 80 years accumulation of the EE new mass. This is only presented as reference at this point. What is in the Earth Core? What is in the core is highly speculative. Science believes it to be mostly iron for several reasons. Initially that was the only material known to give magnetic properties. Then the Newtonian gravity and orbit equations indicated the center of the earth had to be significantly denser than the surface. Finally a number of meteors are found to be of iron and nickel and it is thought they may be from exploding planets. However, it is a long story but others believe the earth formed with a primary hydrogen core and that the core is greatly compressed and under extreme pressures. (8, 24, 47e) One explanation of effects can be read about at: http://eearthk.com/Articles03.html Here Dr. CW Hunt explains how Hydrogen can be forced into the atomic structures of other metals and “densify” them. Hydrogen under pressure can be a metal and magnetic. For those of us who consider only 3 phases of water: a) vapor, b) liquid, c) solid, be aware we do so because we only think about our life at our livable surface pressure. 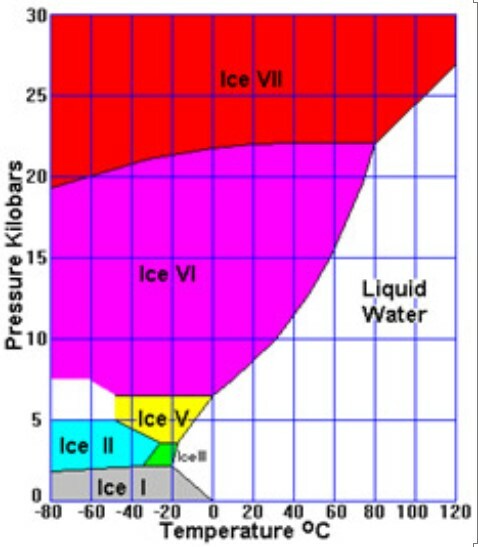 At Wikipedia http://en.wikipedia.org/wiki/Ice one should read about the 15 phases of solid water ice which all act differently under pressures. Fig. 14 shows several water ice phases. 30 kilobars is near equal to 30,000 ATMs. Apply heat to normal ice and it melts from the outside in. It changes “phase”. Ice VII does no such thing. In experiments it refuses to melt, to change phase. It absorbs the heat until all of it quickly changes phase. (8, p. 55) So what? Core stability. These pressures are still minute when compared to that at or near the core. As an example we live at the earth surface at pressure known as 1 Atmosphere (ATM). At about 1,500 feet under the ocean (well past WWII submarine crush depth) pressures are only about 50 ATM’s. Bottom of the Marianas Trench we reach about 1,000 ATM’s. Impressive until you get to the outer Earth core where it may reach 3,000,000 ATM’s. We don’t really know what may be going on in or near the core at those pressures. Since Hydrogen makes up ~ 75% of the known universe and Helium an additional 24%, it makes sense to at least consider they were the primary building blocks of the earth and are now in abundance at the core. But then science believes the core is molten and thus hydrogen would have been destroyed. So the above is not considered. Now however, continued finding of huge quantities of oil, coal, and more recently natural gas (methane composed of Hydrogen and Carbon) at greater depths, augment the argument that rising hydrogen (and not dino fat and other flora fossils) created our primary fuels. (14) So is hydrogen in the core in substantial quantities? Science considers the core to be stable and spinning at a very slow speed. But the hydrogen formation of the Earth theory opens new paths to explore. Following this rarely traveled path one finds a book from an aerospace engineer that indicates that the early Earth and thus the core was made of Hydrogen and Helium and available dust particles which accumulated cold and condensed in agreement with Descartes’theory. (8) If so, how do these elements act under extreme pressure? That author’s premise is that the ice ages and interglacials are caused when the crystalline-like core changes phases and either absorbs heat or gives off heat for long periods during different phases. Quoting, “In moving to a new stable stationary state, solid hydrogen acts like a sponge. Except this sponge goes along with the building pressure until a point is reached where it, of its own accord, drops to a smaller volume. . . the sponge keeps its new volume until it absorbs a sufficient amount of heat. Only then does it return to its original volume.” (8 p. 50) Underlining added. That author indicates that the core can periodically jump to a smaller or larger volume. While he is did not advocate it, if the stability of the Earth axis depends on the equatorial bulge and the bulge is a mere 1/3 of 1% of the radius of the earth then, any slight size change in the core could reduce or potentially eliminate the bulge’s stabilizing factor for a period of time. Can Earth Expansion connect the dots with the coming Mayan Solstice? To develop a feel for Earth Expansion the reader need orient his thinking. That requires a globe. A flat map is distorted and so can’t do. Let the globe be freed of its meridian so it can be held in your hands. Stare for periods of time at sections. First where you think you know. The US and the Caribbean. Mexico. Then the Mediterranean. Then places you don’t know. The Arctic Ocean. Antarctica. The Indian Ocean. Australia. After awhile your mind will begin to see how lands were stretched apart. Extruded like taffy. Flowed like water. Not slammed together as Plate Tectonics would have it. Then you will see patterns. Shapes that shouldn’t be. Alignments nobody ever mentioned. Patterns unrecognized that are clues to the past movements and clues to the causes. As Earth expands new mass must be added to account for an ever increasing gravity that best accords with 80 Ton Brontosaurs, flying Pterodactyl’s and 6 foot millipedes, etc. (19) Where did this new mass come from? While there are other theories, a predominant possibility is that either energy or sub-atomic particles are entering the earth and accumulating at the core. The energy would likely be electro-magnetic (EM) in nature. 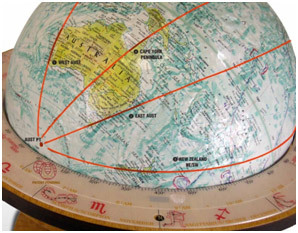 The reader can review the more complete explanation and over 2 dozen such unusual Great Circle lines drawn at: http://eearthk.com/Expand.html (47a) Here in Figs 15a-d only a few will be repeated. Two antipode points are found near the magnetic poles: one below Australia, and one west of southern Greenland. Fig. 15c More GC Alignments in India, Middle East and the Med. Fig. 15d GC’s reconnect At Greenland Antipode Pt. Two antipode points near Earths Magnetic Pole by Australia and Greenland. Two antipode points on the “Tropics of Cancer and Capricorn”, west of Taiwan and within South America. These 4 points form almost a perfect Great Circle by themselves. 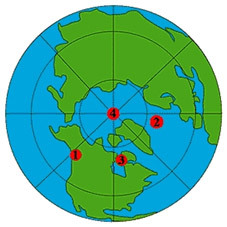 These locations near the magnetic poles and also where the sun is perpendicular to the Earth year round indicates that the continents are being shaped by some Electro-magnetic (EM) force associated with the Sun or at least the solar plane. These GC’s are not the force itself but only clues to that force. The Earth’s annual orbit changes daily where the sun rises and sets and its angle in the sky. Except at Solstice. The reader needs to understand that the Solstice is when these sun changes at dawn slow and stop while Earth is at its maximum tilt. Surprisingly these sun angles can be shown to correlate with the above Great Circles at dawn at dusk. It may be that a force is accentuated at dawn and dusk from the Sun and this is accumulated most at times when it is repeated – at the Solstice, when Earth is at its maximum tilt. A more complete story can be had at: http://eearthk.com/Articles10.html (47g) Fig. 16a-c show how the sun angles shift in a few hours on the Solstice day. Fig. 16 pictures can be enlarged by clicking. They represent the suns dawn and dusk path on Dec. 21, 2012. The light and dark path is virtually the same on every Winter Solstice (inverted during the Summer Solstice). The Australia and Greenland points are shown as red dots. A green line marks the initial GC down the coasts Western Australia, and Western India, and through the Red Sea. 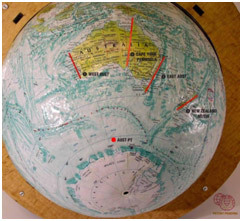 Note how the sun angles connect with all these lines and at the same time the Greenland and Australia Points. Odd, indeed. Fig. 17a-b plots the Australia and Greenland points on the graphics which shows the location where the Auroras are most frequently visible. This is where the suns EM energy battles with the Earth’s magnetic field. Electromagnetic Energy from the Sun or Solar Plane is indicated for the Earth Expansion Mass Increase. Also, it is indicated in reshaping some Earth coastlines prominently at Solstice when the Sun “Stands still” and Earth is at its maximum orbital tilt. How is this Related to the Mayan Galactic Alignment Conjunction? If a Pole Shift Occurs, where could be the new Pole? The Mayans had many accurate Calendars. (21) One was of the 584 day cycle of Venus. Since Venus is closer to the sun, we at times see it to the left of the sun and sometimes to the right. It then moves back to its original position. As it does so, its extreme orbital position can be plotted against the background Zodiac constellations. Mysteriously, when plotted this orbit plots out a near perfect 5 pointed star. Recall as a child you learned to draw this “star” shape in one continuous path. Try that with the Hapgood locations where he believed past poles were located. Start with Point 1. Point 1 to Point 2, to 3, to 4, and then to a new point 5. That would place a fifth point right by the “discovered” Greenland Point at 061.5ºN. Latitude, by 058ºW. Longitude. This could indicate a pole movement down the 055º (+/-) West Meridian line.. The Chandler Wobble is a continuous but small wobble in the Earth Axis that shifts the axis only a matter of feet. 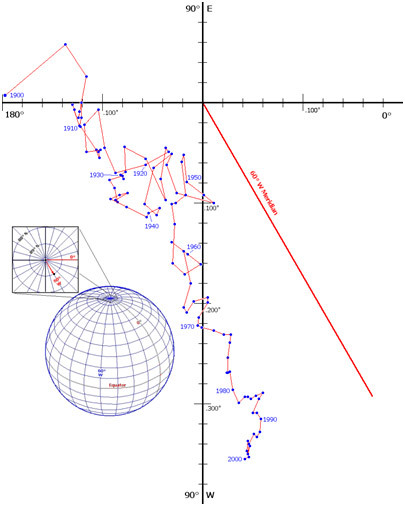 However for the last 100 years this shift has tracked down the 060º West Longitude Meridian as shown in Fig. 20. If the trend continues it may foretell a shift towards the Greenland Point. What More about Pole Shifts? A near term Pole shift is extraordinarily speculative, but should be considered. Figure 8 shows that we are in a warm interglacial period which usually last less than 10,000 years followed by a ~100,000 yr glacial periods. So we are overdue for a cold climate snap. 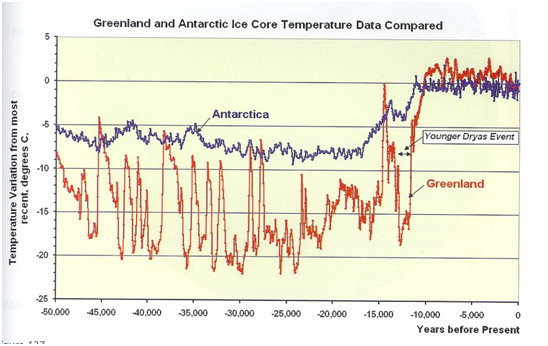 Science believes those ice cores are global temperature shifts. With Pole Shifts, they may not be. They may only be local temperatures near the new pole. There would likely be significantly warm areas on the earth. The path of greatest destruction would be on a line between the present pole and the future pole (050º W. Long?). That would mean that South America and Australia may be the hardest hit. Furthest away from that GC line, central Africa, the Near East, India and parts of the Mediterranean could be less affected. It would appear that the radius of the Arctic Circle of ~1600 mi. could be the primary extent of ice and so would be similar to the last North American ice age sheet extending to around New York City and follow the northern shores of the Great Lakes. Sea levels would fall more than presently because ice would form more on land rather than in the current Arctic Ocean. Another author speculated that the axis continued to wobble – “horizons shifted” – down to perhaps 3,000 BC. 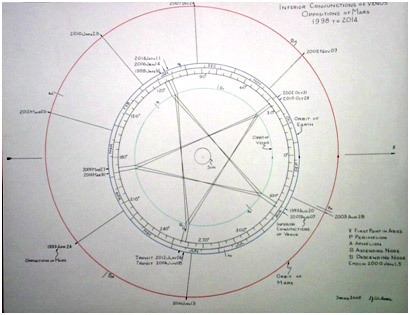 (20) He used the misalignments of “ancient eclipses, from ancient sun dials, from the alignments of pyramids and desert markings” in his study. 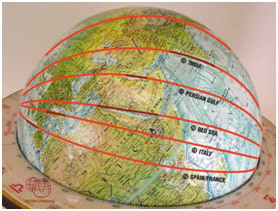 (20 p. vi) Each piece of his evidence presents either a range or bearing (but not both) to the then geographic pole. Nearly 2 dozen alignments can be plotted by this author using techniques learned from naval radar navigation. The simplified graphic Fig. 21 was produced. If the previous pole was located on lower Baffin Island, near Hudson Bay and shifted to the current pole location, then the pole location oscillated around 075 º west longitude Meridian line. The smallest oval shapes seemed to indicate the most frequent and most likely pole movement. The larger ovals plotted fewer potential pole locations. The southern hemisphere would have the same antipodal axis affect on Antarctica. It would appear that once a pole shifts, it may take thousands of years to reach stability. What’s the Degree of Certainty?A correlation has been shown to a one half precession cycle of about 12 – 13,000 years ago. There were drastic climatic changes then. There is evidence that this was caused by a re-occurring Pole Shift. Evidence was supplied that Earth Expansion has all the necessary elements of a cause for such a shift.Those climate changes did not happen in a single day, but were spread over 1,000+ years. It is hard to know how fast they develop. The Greenland temperature graphic does not show any clear 26,000 year catastrophic cycle going further back in time. The Science community believes that the ice shifts are due to the Milankovitch cycle of orbital change and, if so, these cycles apparently do not forecast any significant climate change in the near future. So there is sufficient reason to doubt a near term Pole Shift. However, the consistently short warm interglacials (Fig. 8) end in shorter periods than the one we are in now. It seems foolish to trust that our 12,000 year warm period will never end.There appears to be reliable pass down history in myths, legends, and lore. If so, then we can look to the most read history book which states concerning catastrophes (they) “…will come as a thief in the night.”So nothing will happen exactly on December 21, 2012, when everyone is watching.There would be a higher probability of occurrence within 350 years. Even greater for 1,000 years. Accumulation continues. The first signs would be shuddering within the earth and likely a reduction in the size of the Equatorial Bulge. Then the Sky alignments would slightly shift. How fast no one knows. Maybe it takes 20 years. It would not be good to be near an Ocean Basin, on any side. If it happens, once it happens, the areas of greatest shifting would likely be unlivable.The subject of Earth Expansion should be seriously studied instead of ignored and ridiculed by science. In one of his videos Neal Adams states that once Expanding Earth is recognized, “everything changes”.Exactly. And Science will not make these changes to a revered paradigm until a crisis occurs. Science won’t act, and then it will be too late to study it.So live your life without worrying about a massive catastrophe. It will likely catch us when least prepared. It likely won’t happen during our life times. But perhaps our children or their children will curse we didn’t put away close minded pride and pay greater attention. Don’t ignore it. Don’t focus only on objects coming from the sky.Look to the forces from below. Most references below are not annotated in the text. A (Red) note is placed at the end of each to give an idea of the subject matter. The diversity of information shows that good science and alternative viewpoints work well together.